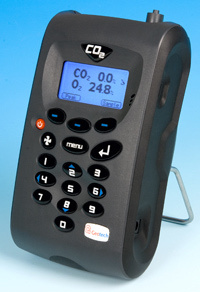 New CO2 analyser specifically designed to monitor C02 for the verification of incubators in research and pharmaceutical markets. This unit has been developed to incorporate the latest technology and specifications requirements that provide the user with a fast, simple to use and accurate piece of laboratory kit. CO2 0-20% with options for O2 0-100%, Humidity Sensor 0-100%, Dual temperature probes 0-50° C.
Large data storage and user friendly software and download. Easy to read large well lit display and built in gas moisture removal .